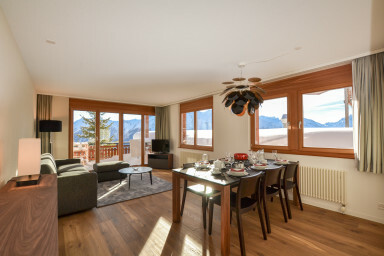 Casa Andrea, one of the most prestigious apartment complexes in Riederalp, is equipped with a magnificent view over the Southern Alps and lies on an A+ location. For many, the building is known as the former Hotel Alpenrose. Several units have been sold (by our sales department Leisure Properties) and are renovated into apartments. In winter, the ski school, as well as the practice slope, is right at your doorstep. All restaurants, nightlife, and supermarkets are within walking distance. Apartment 215/216 is one of the recently (2019) renovated apartments. It consists of two hotel units fused into one luxury apartment. Entering the apartment, you step into the hallway with a variety of storage options. On your right you will find two doors, which lead to the bedrooms. The first bedroom consists of a double bed, a built in closet and a view over the Riederalp practice slope. The second bedroom consists of a double bed, a closet, a commodious en-suite bathroom and access to an open garden. Watch the children practice their skiing in winter, or step into the marvellous nature of the Aletsch Arena, directly from your bedroom. In summer, daily hike adventures are just a footstep away. Furthermore, the apartmant has a seperate bathroom, a fully equipped kitchen (with the most modern equipment) and a spacious living room with lounge area, dining area and entertainment system. Also, the living area gives access to the balcony, from where you can admire a breathtaking view over the Southern Alps. Clothing can be washed in the communal laundry room. The apartment lies in the heart of the Riederalp. The holiday destination is awarded for its family friendliness, its snow quality and the large amount days of sun throughout the year. Casa Andrea is the perfect base for walks or skiing along the glacier. The Bettmeralp is reachable by foot or taxi through the dreamlike Golmenegg and Schweibe forest. Riederalp is part of the car-free Aletsch Arena, a winter-/summerresort equipped with 35 lifts, which will take you to many awe-inspiring viewpoints. The remaining mountain villages of Bettmeralp and Fiescheralp are easily reachable by foot or transport. Do you have any questions regarding this apartment, please feel free to contact us! © 2013-2019 www.leisure-rentals.com. All rights reserved.